Last but not least and maybe my favorite out of the bunch, the Cybergun Sig Sauer SP2022 Sig Pro with metal slide. make sure if you buy this one to get the metal slide version as they make it in a plastic slide version too which I don't carry. 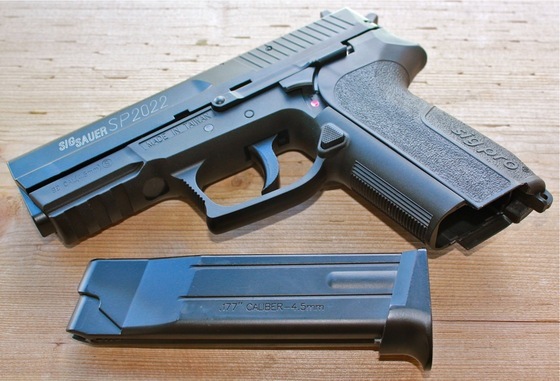 This is a Cybergun distributed air pistol made by KWC, the Sig Sauer SP2022 is a very detailed replica of the real steel Sig Sauer SP2022 Sig Pro used by the DEA and many other law enforcement agencies worldwide. The Cybergun Sig Sauer SP2022 features a metal slide and full size drop out all metal magazine giving this BB pistol even more realism! It has a very light double action trigger and working magazine release and safety.